Not surprisingly, my husband and I have been discussing our options. Move to a larger, more suitable home in our neighbourhood or stay put and renovate what we have? Finish the basement or build an addition? And most importantly, what would each scenario cost? I’m hardly the only Canadian faced with the choice between moving or improving to increase usable square footage. Back in 2012, Canada Post released numbers indicating that of the 850,000 people who changed addresses, 37% moved to upgrade their home for family reasons. More recently, Altus Group measured the boom in Canadian residential home renovation spending, valuing it at $68 billion in 2014, roughly $20 billion more than what was spent on new builds. 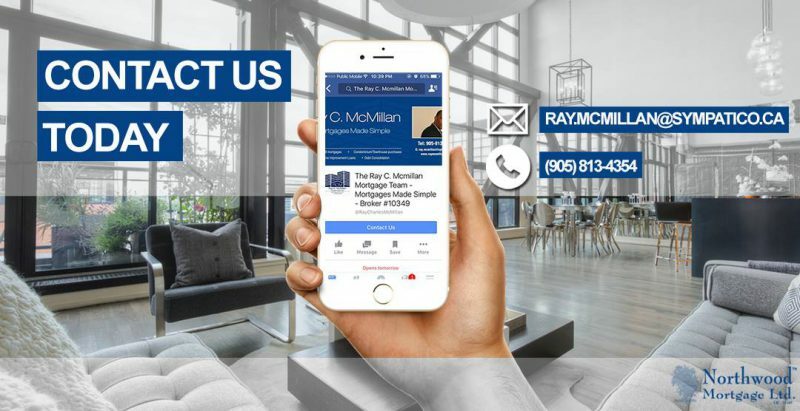 Families grow, possessions multiply, aging parents move in, or a new job means building a home-office space. Although everybody’s situation is different—and let’s face it, you can’t always buy a great neighbourhood but you can change your home—deciding to love it or list it usually comes down to finances. What will it cost to move versus renovate and stay? First, let’s start with the biggest bang for the least bucks: creating more usable space by simply clearing out the junk and getting your house more organized. That’s been our own family project for the past few weeks. Snowshoes that have never seen powder? Gone. An ill-advised yogurt machine purchase? Ditto. Three boxes of baby shoes? Now that’s just embarrassing. Although the act of breaking up with unwanted belongings is free, tackling chaos can be overwhelming without some help. Hiring a professional organizer can be one of the most cost-effective ways to gain much-needed space—with no jackhammer or moving van required. 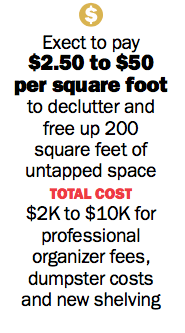 Between hiring a professional organizer’s services and installing new storage solutions in previously unused spaces, expect to spend $2,000 to $10,000, depending on where you live and whether your new shelves are cheaper prefabs or pricier customs. If that sounds unreasonable, consider that “for every box of clutter you remove from your home, you increase the equity by $500,” Warkentin says. But think hard before building new pricey storage solutions if you don’t like your neighbourhood or hope to move to a new school district someday. There’s no point spending the money if you’re just going to sell anyway. Luckily, there are a number of options that range from cheap and cheerful to extreme and expensive that could get you a house that works for you. Here we’ll take a look at four scenarios, from least to potentially most costly, to see how each choice adds up. Earlier this year, Scott Sheppard, an air traffic controller living in the Greater Toronto Area, decided it was time to give his mother, who lives in his basement, a room of her own. A bathroom, that is. “As she’s been getting older, we’ve realized that we needed to build something for her, rather than expect her to walk two flights of stairs to use the shower,” says Sheppard. In the end, it was a relatively easy fix: They simply converted their old attached garage into a laundry and mudroom, and moved the basement’s washer, dryer and deep freezer into it. This freed up space for Grandma’s corner shower, sink and toilet. David Kloss, co-owner of LoganSienna Design in Toronto, says that, for homeowners like Sheppard, it makes sense to maximize space with the footprint that you have—particularly if living in a semi-detached or row house with restrictive zoning bylaws. Moving a wall to, say, create two bedrooms out of one means you can stay in a home you love, while making it fit your lifestyle. And even if the house doesn’t become physically bigger through these renovations, a little ingenuity can go a long way toward making a house feel more spacious. For instance, at a recent reno job in Toronto’s High Park area, Kloss removed a hall linen closet and knocked down walls to create a bigger, more open washroom. And don’t forget the attic. It’s a square footage gold mine, particularly in older homes with steeply pitched roofs. To determine if you can turn your attic into a usable loft, shine a flashlight up there. Got W-shaped trusses holding up the roof? 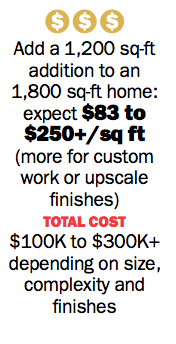 The reno will likely be too costly to be worth it. But if you’re looking at a wide open space with ample headroom in the centre, it might be worth building stairs up through a closet, and adding insulation and heating ducts. Not all spaces are appropriate for renovations, however. Even though adding a room in the basement typically saves you between 25% and 50% of the cost of adding a room to upper floors, some aren’t worth finishing. There are foundation cracks that result in leaks. The furnace is smack in the middle of the room. The ceiling is low. 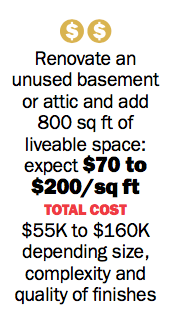 Digging down to gain a few extra feet would cost in the range of $60,000. And to fix everything else? An extra $75,000. That’s before all the fun décor decisions. All rooms aren’t created equal when it comes to pricing either. Contractors tend to quote in the $90 to $225 per square foot range, but if you’re aiming to add a bathroom to the mix or make your kitchen bigger, expect higher outlays: Plumbing, granite, fixtures and new appliances drive costs way up, while simply drywalling a basement or attic is going to be much cheaper. There are a lot of ways to save money—or blow through cash—so plan carefully before giving any project the green light. Michael Berton and Cathie Hurlburt have had 13 years to live with their decision to turn their once small two-bedroom bungalow in North Vancouver into a 2,000-square-foot home by adding a second storey. They couldn’t be happier. The Vancouver market was just heating up when the couple dragged their kids to open houses looking for a larger home—but eventually they decided to stay put. “We kept looking at houses that were three times more money than ours, were just as old and probably needed renovating anyway. It just didn’t make sense,” says Berton now. Instead, they hired a contractor, convinced the bank to help finance the $200,000 reno, moved into an apartment down the street for five months, and then waited for the plaster dust to settle. Although hard to fathom today, the couple once worried about owning a half-million dollar home in Vancouver. But the gamble to increase the space paid off. Not only were they able to raise their three girls in a spacious home, but they made their house even more desirable to buyers. Their home—assessed at $320,000 before the reno—is now worth about $1.5 million. “But I don’t know if the math works like that everywhere, because I live in Lotusland where the house prices are nuts,” Berton cautions. He’s right to question whether building an expensive addition is the best option everywhere. Most house prices don’t appreciate as quickly as they do in hot markets like Vancouver and Toronto. It can take decades before homeowners can recoup costs come selling time. An expensive renovation usually only makes sense if you plan on living in your home for the long haul, says Suzanne Ethier, a realtor in Kitchener, Ont. But for people who aren’t sure if they’ll need to move in five or 10 years? “Without fail, the numbers say sell the house and buy a new one,” she says. The truth is that building onto a house is expensive. Location, size, finishes and labour costs will vary, says Brennan Waters, owner of Oakwaters Construction Ltd., based in Everton, Ont., but generally speaking, “$200 a square foot will give you options.” But expect to pay more if you’re digging down to expand the basement, or if you’re planning wholesale kitchen moves requiring all new plumbing and wiring. What’s more, extensions can come with nasty and expensive surprises—from opening a wall to find old knob-and-tube wiring, to having run-ins with neighbours who are fed up with the construction noise and debris. Banks don’t finance the demolition work either, so that’s coming out of pocket, unless you get a construction loan. All of this isn’t to say building an addition can be the right choice, but just be sure you know what you’re getting into before the backhoe arrives. Sometimes you’ve just got to get out of Dodge and find a new place to live. That was Kate Kuok’s story when she moved from her suburban Toronto townhouse to Oakville, Ont., about four years ago with her husband Gabriel and their newborn. Although their former property had three bedrooms and three bathrooms, soon the baby gear spilled out all over the living areas. Plus, they weren’t enamoured with their neighbourhood, what with drug deals going down on the street. “I always said to myself, ‘I’m going to see how we are with a kid in this place.’ I had my son in June and by August I was saying, ‘We’ve got to get out of here,’” Kuok explains, recalling all the factors that motivated their decision to find a new home. So what does it cost to move? Put it this way: It ain’t cheap. Even if you clear a cool $100,000 after selling your old home, moving into a larger house will likely cost more than that. Take houses in Halifax’s hot South End neighbourhood. A three-bedroom, one-bathroom home is listed at $465,000. Move up to a similar four-bedroom, two-bathroom house and you’re likely spending about $200,000 more. Plus financing. And don’t forget the extras. Realtor fees run around 5% to 6% of the final sale price, so count on at least $23,250, while lawyer fees cost $1,200 to $1,500. With the exception of Alberta and Saskatchewan, there are also land transfer taxes, which vary depending on where you live—for instance, you’ll pay $6,475 on a $500,000 home in Ottawa, while Torontonians can expect to pay $12,200 for that same-priced house. Plus, don’t forget moving costs that run additional thousands of dollars. Despite the financial costs for Kuok’s family, it was a good idea to move. Although the couple spent a little more on the mortgage than they’d budgeted for, they ended up with something money can’t buy: a great low-traffic street with neighbours who look out for each other. You’ll find them on summer nights hanging out in the yard socializing over a beer while the kids whiz around on bikes and scooters. And in the grand scheme of things, that’s just as important as saving a buck.